In a class by herself, the Pride of America is a stunning ship sailing roundtrip from Honolulu to a different beautiful Hawaiian port every day. 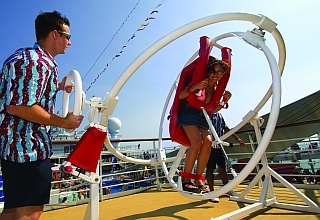 Experience the flexibility of Freestyle Cruising as you enjoy the many onboard amenities. 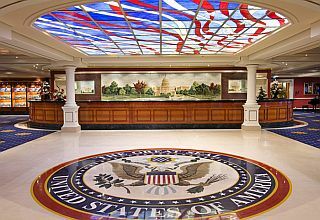 With a soaring Capitol Atrium with a stunning stained-glass dome, to the beautiful main dining rooms, Pride of America is special. Reflecting some of the finest places of its namesake in its decorations, such as photographs in the stairways of the Grand Canyon and Mount Rainier, amongst others, all celebrating America. 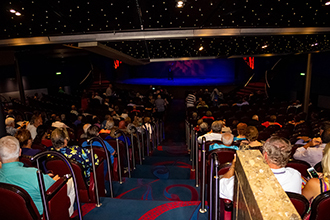 Lots of fun activities and entertainment are offered on Pride of America, as well as luxurious staterooms and suites. Imagine whale watching and viewing the breathtaking Kilauea Volcano and Napali Coast from your own private balcony. 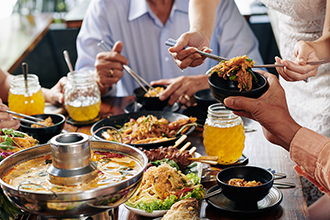 Enjoy a wide selection of "Freestyle Dining" options, ranging from casual eateries to fine dining. 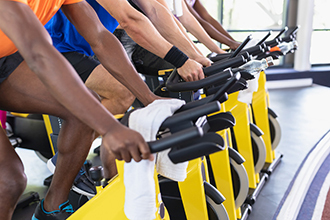 Learn about the Hawaiian history at the unique Kumu Cultural Center and rejuvenate at the fabulous Mandara-operated Santa Fe Spa & Fitness Center, an outdoor basketball/volleyball court, Rascals Kid's Club, outdoor hot tubs, a casino and Broadway- and Las Vegas-style shows. 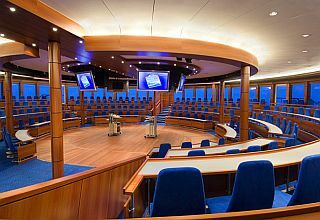 Combine business and pleasure at one of the largest high-tech conference facilities to be found on a cruise ship. 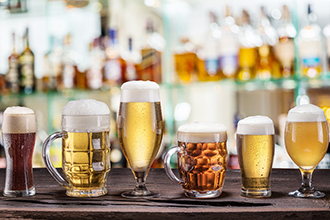 Choose from 9 chic bars and lounges to relax and meet friends for a drink. 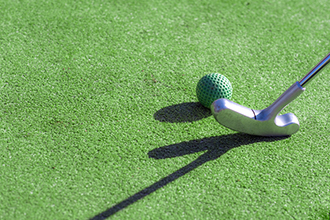 Jog or shoot hoops at the basketball court and play some volleyball. Shop at the New England-style Newbury Street Shops, a lovely arcade featuring high-end watches, jewelry and other items. 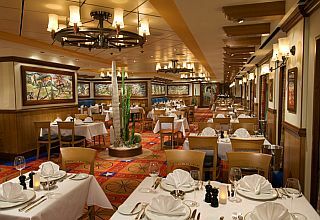 Dining on the Pride of America is an exciting adventure, blending history with fabulous culinary choices. 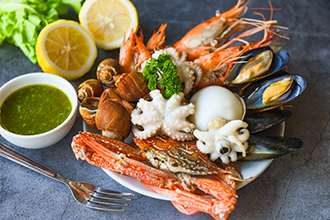 Boasting 14 delicious dining options, with a décor of U.S. themes, including everything from traditional elegant choices to fabulous unending buffets; there is something to please the entire family, including 24/7 pizza delivery. 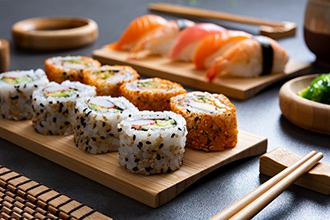 Delicious cuisine is served at specialty restaurants, including fabulous Japanese teppanyaki, sushi and gourmet French, plus a classic upscale steakhouse. Mouthwatering choices are offered at the Art Deco-styled Skyline Main Dining Room, designed to mirror the architecture and design of 1930's New York City. Step back in time to America's Colonial days at the Liberty Main Dining Room for traditional and delicious fare with a décor featuring moments in American history. Upscale Jefferson's Bistro serves exquisite French cuisine. Rock n' roll at the 1950's-style Cadillac Diner, a fun spot for the entire family. 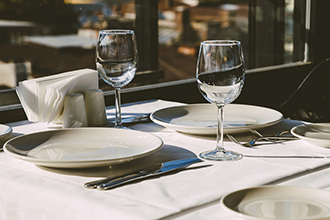 Complimentary room service is offered 24/7. 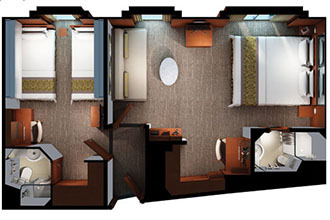 Designed with comfort in mind, your stateroom will be welcoming and relaxing. Flexible accommodations include spacious suites, many with balconies, cabins with gorgeous sea views and luxurious suites. 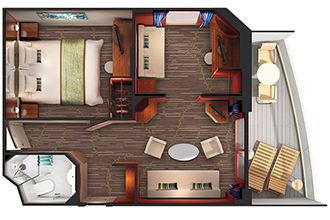 Pride of America also boasts excellent two-bedroom suites, perfect for a family cruise. Get the red carpet treatment at the stunning Hollywood Theater, designed to reflect the glamorous home of movie stars, where fabulous Broadway- and Las Vegas-style shows are presented. 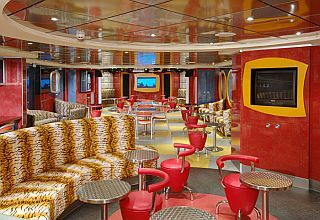 The plush and colorful Mardi Gras Cabaret Lounge features nightly entertainment of dancing, music and comedy. Pride of America cruises on 7 day-sailings year-round in Hawaii, roundtrip from Honolulu. 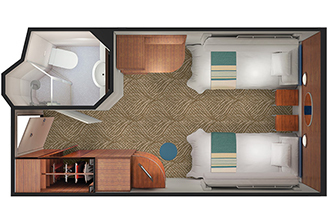 The whole family will have plenty of room in these staterooms. 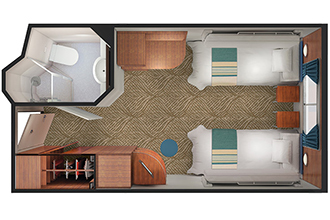 With enough space for up to four, these staterooms have two lower beds that convert into a queen-size bed, as well as a convertible sofa in the sitting area and one pull down bed. Not to mention a private balcony with a great view. Accommodates: 4. 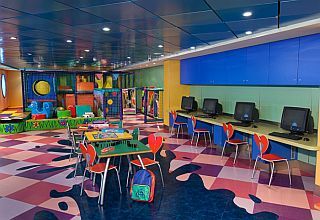 These connecting staterooms are great family accommodations. You can bring the whole family, with room for up to four guests. Features two lower beds that convert into a queen-size bed and a convertible sofa to sleep two more, as well as a sitting area and floor-to-ceiling glass doors that open to a private balcony. Accommodates: 3. 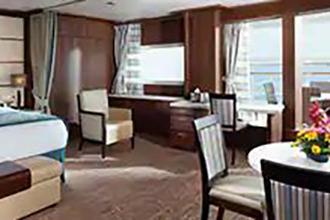 These Large Balcony staterooms can accommodate up to three guests. With two lower beds that convert into a queen-size bed and a convertible sofa in the sitting area to accommodate one more. And the large balcony offers an incredible view. Accommodates: 3. 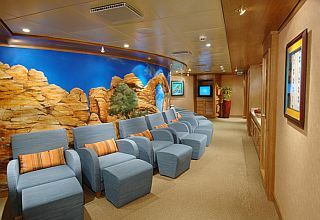 These Inside Staterooms are a great way for the whole family to cruise. 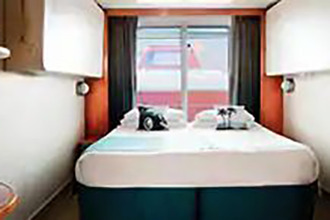 With room for up to four guests these staterooms offer two lower beds that convert into a queen-size bed as well as pull down beds to accommodate to more. Accommodates: 4. 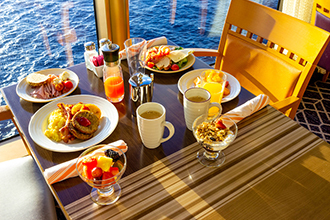 An Inside stateroom is the most affordable way for you to cruise. These staterooms can sleep up to four guests, with two pull-down beds and two lower beds that convert into a queen-size bed. 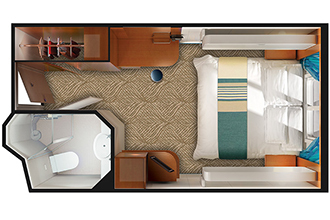 Accommodates: 4.
hese staterooms combine comfort and value. They include two lower beds that convert into a queen-size bed, additional bedding to accommodate more and a picture window with an obstructed view. 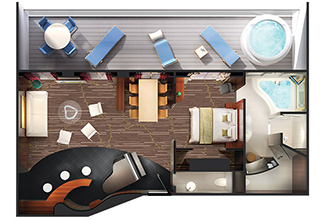 Living room, private balcony, two separate bedrooms (one with a king-size bed and walk-in-closet and one with two lower convertible beds) a pullman sofa, two TVs, two bathrooms one with bath and shower. Butler service and concierge available. Accommodates up to 5. Living room, dining room, private balcony with hot tub and dining area, two separate bedrooms one a with king-size bed and walk-in-closet and one with two lower beds, baby grand piano, CD/DVD library, two TVs, luxury bath with whirlpool tub and separate shower and guest bathroom. Butler service and concierge available. 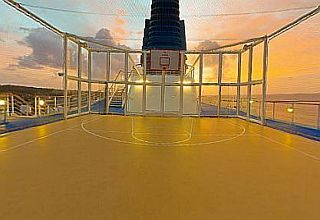 Located on deck 12, forward, accommodates up to 4. Living room, dining room, private balcony with hot tub, two separate bedrooms one with king-size bed and walk-in-closet, a double sofa bed, CD/DVD library, two TVs, luxury bath with whirlpool tub and separate shower and guest bathroom. 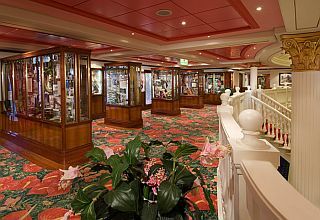 Butler service and concierge available (Staterooms 13000 and 13502 do not have a hot tub on balcony). 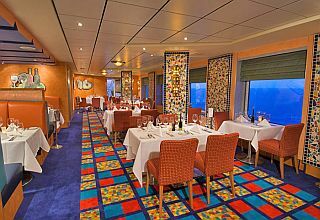 Located forward on decks 8, 10, 12 & 13, accommodates up to 4. 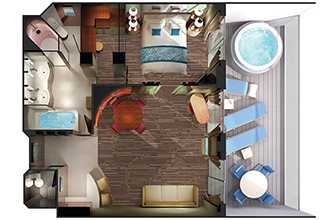 These suites include a bedroom with king-size bed, walk-in closet, and luxury bath with whirlpool tub pool and separate shower, a double sofa bed and double murphy bed. 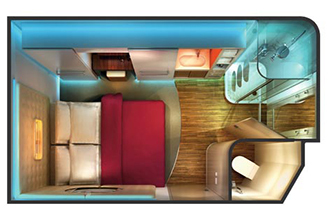 Also features two TVs and a large private balcony. 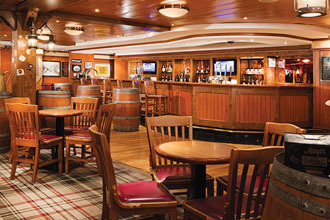 Located forward on deck 13, accommodates up to 6. Living room, private balcony, bedroom with king-size bed, a double sofa bed and double murphy bed (only on SE & SF), CD/DVD library, walk-in-closet and bath and shower (except in handicapped staterooms). Butler service and concierge available. Located forward on deck 10, 12, 13, accommodates up to 6. Living room, private balcony, bedroom with king-size bed, a double sofa bed and double murphy bed (only on SE & SF), CD/DVD library, walk-in-closet and bath and shower (except in handicapped staterooms). Butler service and concierge available. Accommodates up to 6. Living room, private balcony, bedroom with king-size bed, a double sofa bed and double murphy bed (only on SE & SF), CD/DVD library, walk-in-closet and bath and shower (except in handicapped staterooms). Butler service and concierge available. Located forward on deck 11, 12, accommodates up to 4. Living room, private balcony, bedroom with king-size bed, CD/DVD library, walk-in-closet and bath and shower (except in handicapped staterooms), and double sofa bed and double murphy bed. Butler service and concierge available. 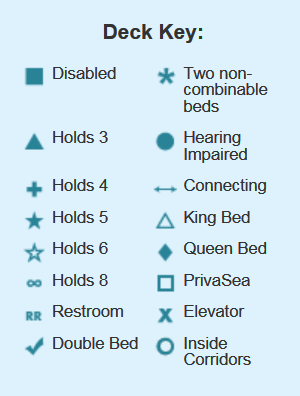 Accommodates 6. Living room with convertible sofa bed, private balcony, two separate bedrooms one with a queen-size bed and one with a convertible sofa bed and three TVs. Located aft on decks 7, 8, 9, 10, accommodates up to 5. Living room, convertible sofa bed, two separate bedrooms each with two lower beds that converts to a queen-size bed, single and double french windows, two bathrooms and two TVs. Accommodates: 7. 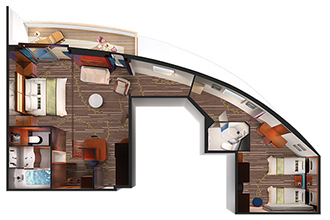 Now, for the first time, there's a group of staterooms specifically designed and priced for the solo traveler. 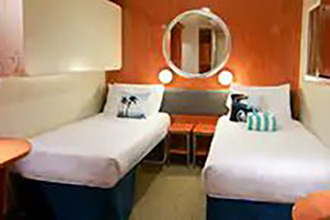 These Studios are created with your comfort in mind with thoughtful features like soft mood lighting, a full-size bed, a door to the Studio Lounge and separate areas for your bathroom, sink and shower. All this in 100 square feet of living space. 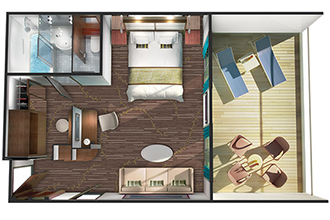 Plus, you’ll have private access to the exclusive Studio Lounge. 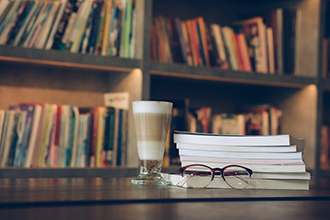 Here, you can start your day with a morning coffee, mingle with other Studio guests, have a bite to eat and plan to meet up again in the evening for a drink. Accommodates: 1. Omelettes and pastas made to order, a fantastic salad and dessert bar, carving stations, you never know what you'll find each day at the Aloha Café, but it's always action packed and satisfying. Little kids even have their own pint-sized buffet and dining area. Steak is the standard at our American-style steakhouse. 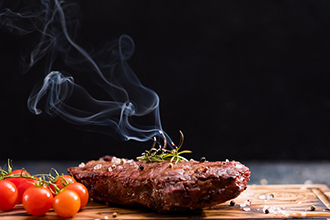 Take your pick from premium choice cuts of Angus beef like our traditional T-bone or tender Prime Rib. 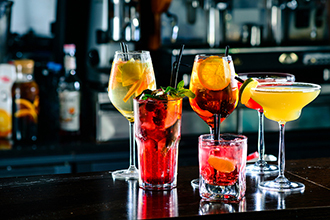 Your mouth will water, so sip your favourite cocktail in anticipation. And don't forget to order our made-from-scratch jumbo crab cakes and a side of our famous truffle fries. You deserve the red carpet treatment. 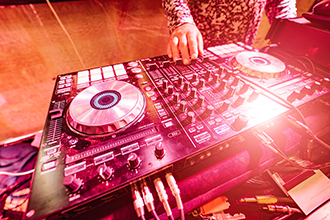 Enjoy Broadway and Vegas-style shows in a Hollywood theater. It's your move! Enjoy the game of chess on a large outdoor chess board. It's a great way to meet some of the other passengers. Need a new bathing suit? How about a surprise gift for your sweetheart? 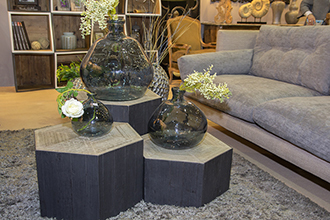 Newberry Street Shops offer a wide selection of brand name and specialty goodies. What better than a Hawaii cruise? 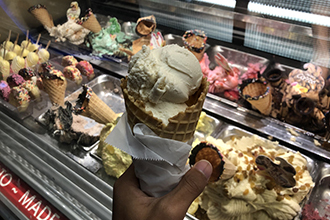 A Hawaii cruise with a delicious scoop of gelato. 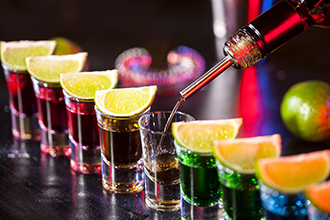 With so many flavours to choose from, all made fresh onboard, you may want to make it a double. For that double, vanilla, soy, extra hot latte with extra foam, the John Adam's Coffee Bar is at your service with a wide variety of specialty coffees, tea's, pastries and cookies. Inspired by Hawaii's Royal Palace Hotel, often referred to as the "Pink Palace, on Waikiki Beach. 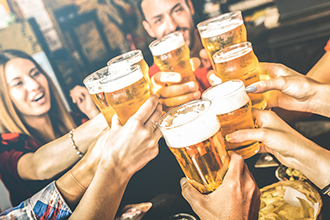 Toast to your good health and good luck with champagne. You may also retreat to the cigar lounge. This quiet area in a tropical setting has glass walls Read, make conversation or do nothing at all. 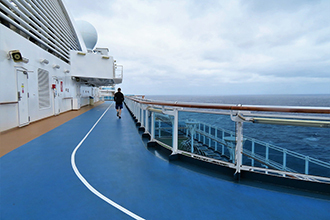 Run circles around the other passengers or get in your daily walk while you're at sea. Breakfast always tastes better after a good walk or run, right?